(by Brad Lendon, CNN and from ArmyTimes.com) — For the first time in 40 years, the U.S. Army is making changes to a century-old piece of hardware, dog tags, the identification tags that hang around each soldier’s neck. 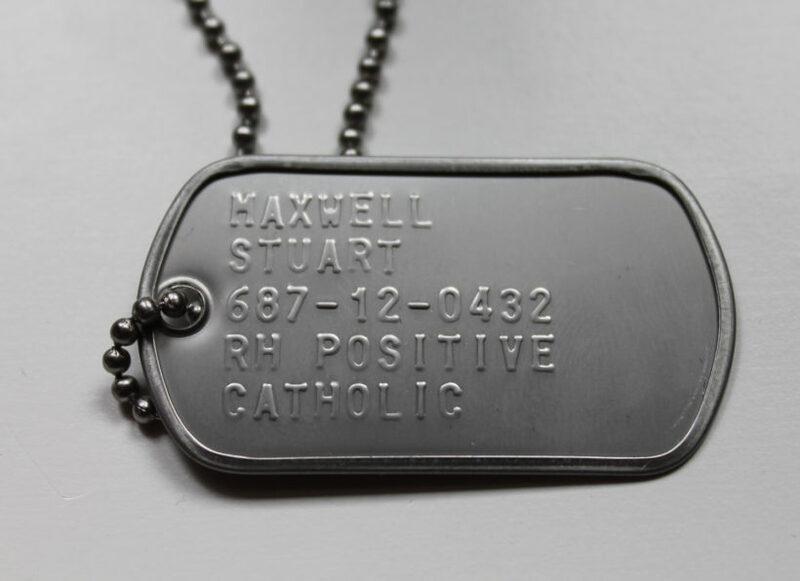 For a low-tech thing like the aluminum dog tag, the reason for the change is decidedly high-tech, the threat of identity theft. On the new dog tags, the service member’s Social Security number will be replaced with a randomly-generated, 10-digit Department of Defense identification number. “If you find a pair of lost ID tags you can pretty much do anything with that person’s identity because you now have their blood type, their religion, you have their social, and you have their name. The only thing missing is their birth date and you can usually get that by Googling a person,” Michael Klemowski, Soldiers Programs Branch chief, U.S. Army Human Resources Command, said in an Army press release. The change was mandated in 2007, but it has taken the military this long to replace the Social Security number with the 10-digit idea number through a number of systems, Klemowski said. Removing Social Security numbers from dog tags is one of the ways the Army is trying to safeguard personal information, Klemowski added. The change is in accordance with new Defense Department guidelines calling for less use of Social Security numbers. It also comes on the heels of several data breaches that compromised the personal information of millions of service members, government employees and veterans. The tags became part of the Army field kit shortly before World War I. By July 1916, the Army was issuing two of the tags to each soldier, one that would stay with the remains of those lost in battle and one that would go to the burial unit, according to the Armed Forces History Museum. Klemowski said the change would not be immediate for all soldiers. “We are focusing first on the personnel who are going to deploy. If a soldier is going to deploy, they are the first ones that need to have the new ID tags,” he said in the Army release. The Army has been working on making this change for years; it was first outlined in the DoD Social Security Number Reduction Plan and the President’s Task Force on Identity Theft Strategic Plan in 2007, according to the Army. It took time to figure out how to implement the change because several Army systems used a soldier’s Social Security number, and all for different purposes, Klemowski said. Each system had to be reworked so they worked with one another and the DoD ID number, he said. “More and more systems are going to go to the DoD ID number as technology catches up with us and we are able to phase out the Social Security number,” he said. Compiled from news reports by CNN and Army Times. Reprinted here for educational purposes only. May not be reproduced on other websites without permission. 1. What changes are being made to the dog tags the U.S. Army uses? 2. Why are these changes being made? Be specific. 4. If the dog tag change was mandated eight years ago, why is the order only being implemented now? 5. Which soldiers will be issued the new dog tags first?